In the aftermath of the 2017 North Bay wildfires, a coalition of scientists, nonprofits, public agencies, private businesses and volunteers addressed a secondary catastrophe looming with the coming rainy season: toxic ash from the thousands of burnt structures that threatened to wash into Sonoma County waterways. To prevent this environmental hazard, ecologist Erik Ohlsen of Sebastopol's Permaculture Skills Center created the Fire Remediation Action Coalition Facebook group ("Natural Remedy," Nov. 29, 2017). 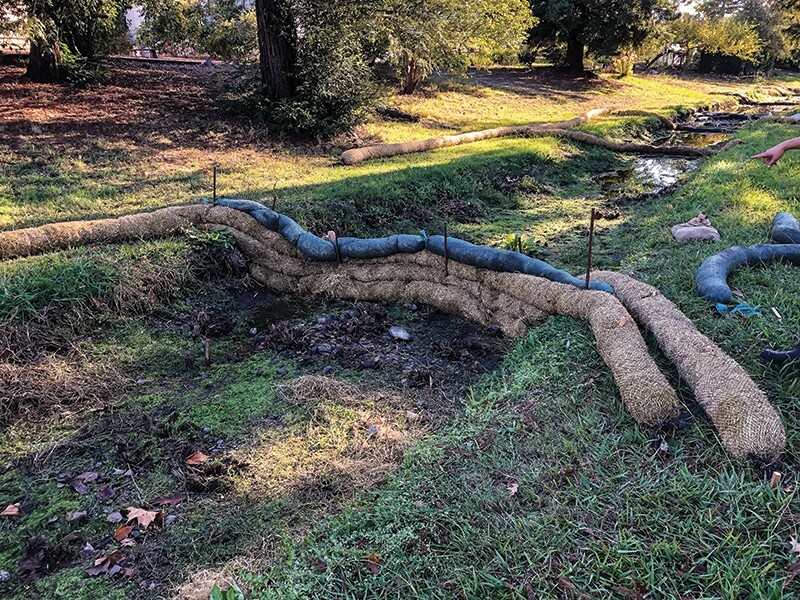 They quickly installed rice-straw wattles (expandable fiber rolls)—some inoculated with mushroom mycelium (fungus' underground network) and compost bacteria—hoping to neutralize toxic runoff. "PCBs, dioxins and heavy metals can be contained in ash, and those can harm human health and wildlife, watersheds and aquatic creatures," says Ohlsen. Did these methods work? What lessons were learned that can help with future disasters, including 2018's Camp fire? The answers are surprisingly complex. Wattles seemed the simplest solution for stopping runoff, barring storms or mudslides. Washington state mycologist Paul Stamets championed mushrooms' transforming of toxins through chelation. Effective at cleaning up oil spills and pesticides, mycoremediation can sequester—although not neutralize—heavy metals. But it hadn't been attempted with large-scale, post-fire toxic runoff. The team decided to try this tool, to save watersheds. Materials were donated by Sonoma's Gourmet Mushrooms, West Marin Compost and Sonoma Compost Company. Environmental groups Russian Riverkeeper and Clean River Alliance organized volunteers to help construct wattles donated by Petaluma's Wattle Guys. Sonoma Compost soil scientist Will Bakx mixed the straw with manure, compost bacteria, and oyster and turkey tail fungi, which break down hydrocarbons like petroleum products in burnt structures. North Coast Regional Water Board monitoring coordinator Rich Fadness confirms that the board also helped provide and install wattles. The fires' huge scale prevented the team from accessing every gutter or culvert, so they prioritized areas with wider effects. Ahead of the rain, in Coffey Park, Bakx and Clean River Alliance's Chris Brokate focused wattle placement at storm drains entering Coffey Creek (connecting to the Laguna de Santa Rosa and Russian River watershed). Other teams installed wattles in Larkfield-Wikiup. It was hoped that peer-reviewed data would show how well these efforts protected water resources. But in the heat of the fires, there was no time to set up protocols for collecting data. Currently, regarding 2017 post-fire mycoremediation, Ohlsen says, "we don't have conclusive evidence that it helped in any way. But," he stresses, "that doesn't mean it doesn't work." His team worked as fast as possible under emergency conditions, trying everything to protect water. Going forward, what lessons were learned? Forecasts predicted a warmer, wetter winter. Managing runoff is the main thing, post-fire, to avoid polluting waterways, says Ohlsen. Wattles, logs and other methods can intercept ash and sediment runoff. This more immediate, short-term deployment should focus on storm drains, streams with endangered species, and water supply. Managing biomass takes longer. "One winter isn't going to wash all the pollution away," says Ohlsen. "The second year there's still going to be issues with runoff and sediment." Hazardous trees are being removed post-fire, but are hauled away instead of being used for erosion control or compost, encouraging moisture and fungi colonization. Combating drought should be an important component of fire ecology, turning soil into sponge. California land needs fire for nutrients and seed dispersal. Burned wilderness areas don't need remediation unless there's human-caused erosion or runoff. The team was already laying down straw, hospitable to certain mushroom species—"not because we thought it was a silver bullet, but because we need to use every tool in the toolbox," says Ohlsen. Better mycoremediation practices, per Stamets, use wood chips, inoculated cardboard or straw bales, spread across drainage and culverts. Thicker biomass layers, and vigorous oyster mushroom varieties, encourage mycelium spreading. "We got a lot of press, people got very excited about this idea that nature can heal our toxic world," Ohlsen says. But mushrooms need dark, moist environments, rather than dry, sunny southern slopes. Scientists should determine site-specific technology using all available bioremediation tools. In phytoremediation, plants like sunflowers and mustard break down toxins. Bacterial remediation uses compost tea, lactobacillus and biochar compost. "Within these natural allies," Ohlsen says, "there's lots of potential for cleaning up toxins post-fire." The next steps? "In order to prove this, we need monitoring through at least two wet seasons," says Ohlsen. "If we want to gather data, we must implement in areas that we can come back to." Testing water and soil for toxins, and growing fungi or bacteria in labs, allows scientists to determine approaches for particular conditions. Site-specific design and mapping help scientists determine and track strategies to adapt elsewhere, followed by rigorous monitoring and documentation, using scientific methodologies and peer review throughout. Funding and reliable volunteer/citizen science teams enable critical long-term follow-through and a planned, proven response to future fires. The Permaculture Skills Center can be a meeting site. Cheap, available materials like wattles, wood chips, straw, mycelium and seed should be stored, ready for deployment. Sonoma County was fortunate that public agencies and nonprofits coalesced, using citizen action; other communities may not have such resources. Every post-fire rainy season, preventative community teams need to be ready, led by experienced practitioners. "The best time to plan is now," Ohlsen says. Future fires are inevitable. Butte County's Camp fire is now the deadliest and most destructive in state history. U.S. Geological Survey maps of the fire extent and likely resulting debris flow show its widespread threat. Butte has organized its own Facebook coalition, the Camp Fire Restoration Project, and begun distributing donated wattles. They're talking with Ohlsen's group, and worked with Fish & Wildlife to set up preapproved legal access to enter private property. Some landowners are on board, enabling testing through multiple seasons. The project also has sponsors: Abundant Earth Foundation and Ecosystem Restoration Camps. These global restoration professionals provide organizing platforms, with groups forming in California, Europe and elsewhere. Hopeful about the Paradise team, Ohlsen says organizing outside of emergency mode has caught on. This is a multi-year process, he emphasizes. "We need to develop remediation teams for the next fire." Post-fire communal action must be harnessed into a restoration action plan. Ohlsen feels confident that by the next fire season, "there's going to be some kind of team in place."